More and more, technology entrepreneurs are interested in creating products and services that will support older adults to live healthier, more independent lives. Technologies such as home monitoring and automation devices, wearable sensors, and service robots may not be designed with the older adult in mind, but they offer the potential of improving the quality of their lives. Sadly, many of these products are fundamentally ill-suited for those with reduced function and mobility, and as a result have been ignored or abandoned by those who look to benefit the most from their use. The DRiVE project has studied innovation ecosystems, particularly those that are leaders in building communities where there’s a focus on health and age-related innovation and technology development. There’s a lot of literature on the importance of having universities, governments, and businesses collaborating to build these innovative ecosystems. What’s missing from this list? The people who will use and benefit from the innovations – older adults and their caregivers. Is it possible that excluding these key stakeholders from community-building activities, and the development process materially affects their success? DRiVE’s ECOTECH (Engaging Older Adults in Health Technology Innovation Ecosystems) project, led by Dr. Heather McNeil, investigated this very issue. What she found is that many older adults want to be meaningfully involved in their communities, for as long as possible. As many Canadian communities aspire to be senior-friendly, and build an innovative environment where entrepreneurial business thrive, we wanted to find out what it would take to get older adults more involved in planning and building innovative communities, that were focussed on making their lives easier through novel technologies. We first searched the published articles to learn what scientists had previously studied to answer the question: How can we involve older adults in communities innovating for health and aging? We discovered that this is a relatively new area- so there was lots to explore! In the next step, we involved older adults and traditional ecosystem partners, from across Canada, in interviews to find out: how interested and ready they were to use a more inclusive model for technology development; and how older adults are currently involved. Overwhelmingly we heard people say they were very interested, and they had lots of questions about how to make it work well. 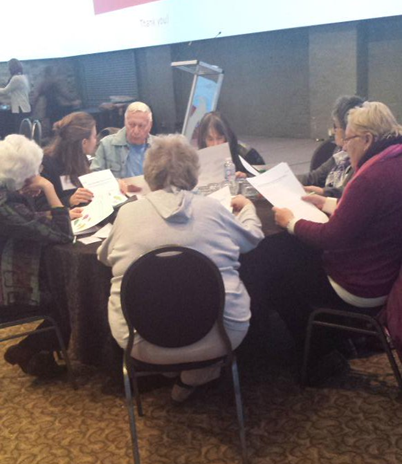 In the third step of this co-creation process, participants collaborated to identify what it would take to meaningfully involve older adults in communities innovating for health and aging. The result was the ECOTECH framework- 62 priority ranked ideas grouped into 7 theme areas. Older adults and caregivers advocating for more meaningful roles in innovation happening in their communities. Partnering with older adults and their caregivers in communities innovating in health and aging will not only help to address adoption issues to get technologies into the hands of those who will benefit most, but will ensure that folks can remain vibrant community members for as long as possible!